for the wonderful hiking destinations I've been to..
for having the strength, provisions and perfect time to visit beautiful mountains in the Philippines..
for surviving the rainy treks and for enjoying those blessed sunny day of hiking..
for the quick views of soaring birds, flora and fauna and other wild creations..
for the safe, purposeful and fruitful trek..
to those who became my friends and companions in the heights.. Thank you! New year. New plans. New trips. For a typical outdoor man and climbing enthusiast, it's another year of journey, more target mountain summits to reach. Yet I believe some people out there would love to try an adventure for the first time and one or more hiking destinations are on their bucket lists. And they would love this 2013 either a year of outdoors and adventure or this could be the start of something exciting they could ever experience --- a year of getting out of the shell. Although the title is especially dedicated to the newbies, whether you are a newbie or an all-time weekend/weekday climber, this post is for both of you. This could either be a checklist for your first, second or third climb or just simple reminders/reference in your usual climbs. In my more than 2 years in mountaineering, I am not yet a veteran. However I could instead share simple and practical lessons i learned from various climb events I joined with. 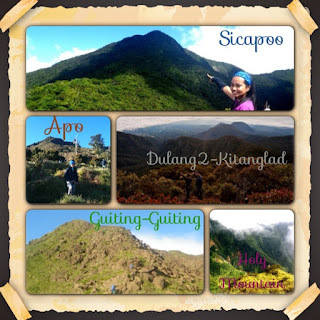 I can still remember my first time to join a climb together with mountaineers, that was in Mt. Batulao where there is no water source at the camp site, I did not bring plenty of water that I could not even contribute to the group for cooking our food. Another thing during the same climb was when I brought a lot of shirts and a thick towel which turned out to be really unnecessary making a real bulk on my bag. Imagine how bulky it was when I didn't even have the real mountaineering gears like cook set, tent, etc. There was also a time when I brought a lot of trail water and cooking water yet there's actually a water source in Mt. Pulag near campsite(it's because I kinda learned a lesson from such mentioned first Batulao climb). Another instance was when I wasn't able to do a proper waterproofing making my clothes and other things almost wet, that was really a rainy trek in Benguet. It added more cold feeling wearing a slightly wet jacket. Thankful I was able to sustain it. Also, there was a little regret in me even when I started doing a hiking activity. That was a daytrip in Mt. Pinatubo and since it's my first time and so ignorant, I bought stuff that I could not even able to benefit from when I finally became a mountaineer. I should have bought quality gears so that they could have been useful up to now. I didnt ask, I didnt made a research. Anyway, when I did my first "serious and official " climb in Batulao, I knew for sure that succeeding hikes could follow that's why i really bought a good pair of hiking shoes. Above-mentioned are only few of not-so-good instances that I would not want to be experienced by a first time climber like you. Therefore, I listed down some tips for you as your reference on the preparations. 1. Know what you are climbing. Is it a major or minor climb? 2. Assess yourself if you are fit with the target mountain. Do some trainings like run or climb and other warm ups, if necessary. 5. At least read the itinerary of the climb so you can manage your expectations. 6. If participants are divided into meal groups, coordinate with your group mates for the meal plan. If meals are inclusions to the climb package, you dont have to worry about the food esp in the campsite. 2. Be mindful of the proper waterproofing. This is to avoid getting your things wet in case of rain or river trekking. You should ask yourself if you are going to engage into frequent hikes. I understand you cannot decide for it right away, not until your first or second climb. You can only assess if you will join again after your experience in your first ever or second climb. So I suggest you only buy things which you think you can use in your trips other than hiking (that's if you decide not to climb too often). For example, if you have other way to just borrow gears, you may do so. But if you decide to buy one, just buy quality gears most especially trekking shoes and backpacks as they may be so beneficial for a significant time and for your convenient and safe climb. Knowing why you climb affects the way you spend for this extreme hobby. Just remember that you only buy those of good quality that can last for a long time. There are lots of both local and foreign products, that are still friendly to the pockets. My personal choice is Salomon for trekking shoes and The North Face and Deuter for backpacks. All other gears, I usually buy from Conquer, a local outdoor shop. If you are not too choosy and you are patient enough, you can get a good score on hand-me down branded mountaineering products from online and ukay-ukay. When you have finally decided that you love mountaineering to the point that you are targeting more mountains or you even have deeper reasons for climbing and you are convinced enough that you will really make it as your regular hobby, that's the only time you buy camping gears like tent, portable stove, cookset, knife and lamp. Further to these are already add-on gears like GPS, altimeter, etc. You should know your priorities. They say mountaineering is an expensive hobby. I both say yes and no. Yes, the gears are expensive. You will really fall into the side of absolute Yes if you do not know how to spend and buy wisely. Investing in mountaineering gears is rooted and depends on your passion. It will somehow never be a big burden to your pocket if you know why you climb. Besides, it is never buying on a bulk basis. It takes time to save up and collect the necessay items you need. Normally, one can gradually learn in every actual climb which gears are perfect for you. Don't be in a hurry. You can have it all with proper budget and research. Think first before buying. You just have to answer two things: 1. Is it worth and quality enough to save up for it? 2. Do I really need it? 1. Enjoy the trail. Catch more photos of the scenic views -- mountainous views, cliff, plants, flora and fauna, different species and the like. 2. Have a good interval of trek and rest. You may have enough time to have a break and rest. 3. Enjoy the company of the mountaineers or the group. Laugh and joke a lot. Establish and initiate a good conversation. Enjoy the social time during the camping. 4. 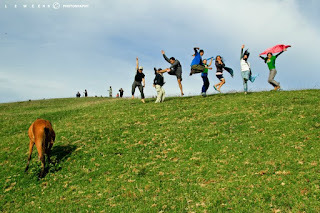 Feel the camping on its most inconvenience yet fun experience. 5. Be watchful especially on the trail you are stepping to. Focus and have extra care trekking. Don't let yourself become miles away from your companions and guide. 5. Have an adventurous spirit. Be determined that you'll make it to the summit, finish the climb, survive the trekking and the camping. Just imagine if it rained? What would you do? Would you cry and get annoyed on the wet and muddy trek or would you feel the rain and aim to survive? 6. Live the LEAVE NO TRACE rule. Be responsible to the nature. Dispose your garbage properly and don't pick anything, like plants or flowers, from the mountain. Upon your descent and respective "home sweet home", carry on with your experience -- sort of adventurous and inconvenient trip yet indeed fun. Only few people dare to risk and tire themselves with these activities and only few have witnessed personally the beauty of nature. Be proud, you are one of them. You should also remember that not because you do a lot of hiking, you are already considered a mountaineer. Individuals have different reasons why they climb. Perhaps some do it to socialize, some do it to just visit and witness some do it for noble reasons, others just pass by to experience what it feels like to do hike and camp. Having identified the reasons why you do it, in one way or another, it has an impact on both the mountain and yourself. So whatever reasons you have in your mind, you do the climb with passion, great respect and responsibility.